Camy's Loft: My latest newsletter and my cool auction item! My latest newsletter and my cool auction item! I gave an update on my 4th Sushi book, Weddings and Wasabi, and my next books with Zondervan and Love Inspired Suspense, and I posted a new contest. If you're not on my newsletter list but want to be, just head over to my website and fill out the form on the bottom left of the screen (with the cool purple chair!). I only send out 4 emails a year, so you won't have to worry about a lot of emails in your Inbox. And if you want my latest newsletter, just email me (through my website) and I'll forward you a copy of it. In the meantime, go to my Brenda Novak auction and bid! 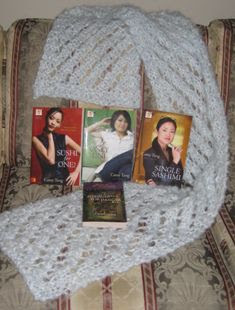 I'm auctioning off Sushi for One?, Only Uni, Single Sashimi, and Formula for Danger, as well as the fuzzy blue scarf Stephanie is wearing in Formula for Danger, and a 30-minute phone call with me for writers or readers!